I attended the open water swim clinic at Stansbury Lake on Saturday and had a great time. The clinic was sponsored by the University of Utah's PEAK Academy and US Trisports. Shannon Mulder was a very entertaining and insightful instructor and gave us all valuable tips and experience. To start out, we spent some time on the shore talking about everything from nutrition to how to choose a pair of goggles and how to put on your wetsuit and swim cap. Once we were in the water we simulated a race start and talked about positioning and start strategy. We practiced sighting and linear swimming, getting past swimmers who are in your way, drafting and turns. Shannon helped put to ease a lot of the worries that face first time open water swimmers by letting them experience what it will be like on race day. All in all it was a great clinic that I highly recommend to open water swimmers and triathletes. The clinic is geared towards beginners, but there are tips and ideas for all levels of swimmers. The clinic is a bargain at only $20 for over an hours worth of instruction and practice. The PEAK Academy at the University of Utah has several other open water clinics this summer including another clinic at Stansbury Lake on Tuesday May 19th. Please visit their website for more information. Stansbury Lake is a great venue for open water swimming and I am looking forward to the Stansbury Tri next weekend. Water conditions were calm with good visibility and moderate temperatures. I didn't bring a thermometer, but I would guess the temperature was in the mid 60's. 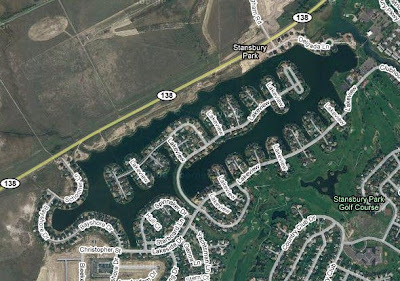 I would love to see a swimming race at Stansbury Lake. The lake itself is oval shaped with homes on an island in the middle. It would be an exciting race to start at the boat dock and swim around the island to the road and back. I swam down one side and back and it was just under 2 miles. I would guess that to swim around to the road and back would would be about 3 miles. 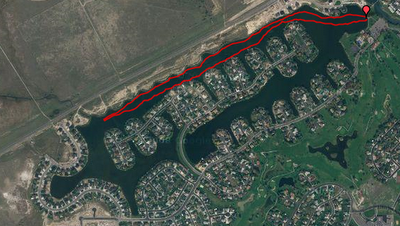 Here is a GPS map of my swim using the method outlined in this post.